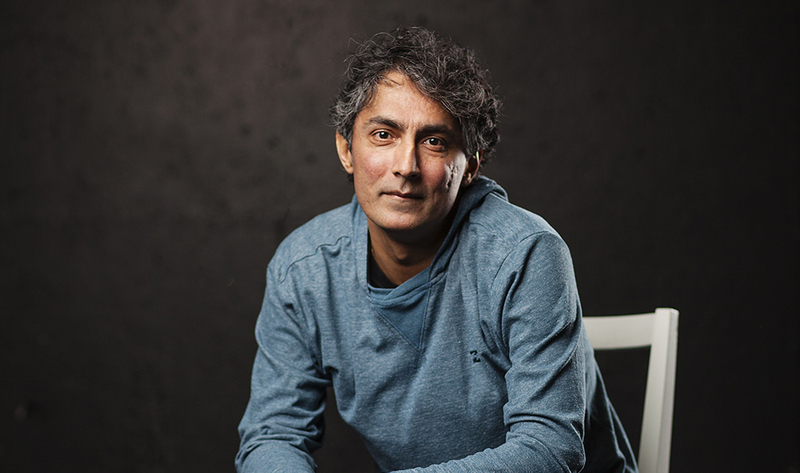 Arun Lakra leads two lives. By day, he’s an eye surgeon who practices out of the Calgary Ophthalmology Centre. By night, he’s a professional artist who dabbles in just about every form of writing. Lakra says he wishes that he could tell people that that his unique career structure was established by design, but that doing so would actually be pretty disingenuous. In fact, he was well on his way to pursuing a “run-of-the-mill, non-hyphenate” career before his artistic calling came knocking. Of all places, his eyes were first opened to the arts while in medical school. On a total whim, he entered a writing contest and, to his surprise, the short story he submitted won first prize. In retrospect, he modestly figures that he was the only person to enter the contest, but, regardless of circumstance, the victory ignited a passion within him. In the years following that epiphanic experience, Lakra nurtured his curiosity until it blossomed into a hobby and then nurtured his hobby until bloomed into a full-blown career. Today, he’s the proud author of a series of critically acclaimed books, plays, songs, and film scripts, and is perhaps best known for writing the award-winning play, Sequence. Sequence, like its author, is very interdisciplinary in nature. It tells the stories of a stem-cell researcher and a professional sports bettor, and intertwines the two narratives to playfully examine the relationships between logic and metaphysics, science and faith, and luck and probability. Lakra will be visiting McMaster University from November 6-8, 2018. As a joint initiative between The Socrates Project and McMaster’s Arts & Science Program, Lakra will be holding rehearsal workshops, a table reading of Sequence alongside theatre and film artist David McIlwraith at the Black Box Theatre in L.R. Wilson Hall, and an interdisciplinary career talk with Artsci students. While at McMaster, Lakra will be speaking about the important life lessons that he’s gleaned from his interdisciplinary journey. He’ll talk about goal-setting, high-risk careers, what constitutes risk, risk reducers, and the concept of subplotting. For more information, visit socrates.mcmaster.ca or artsci.mcmaster.ca.